Hilltops is rapidly emerging as one of the most exciting viticultural regions in Australia. Viticulturally, the region can be summarised as Barossa meets the Grampians, power and concentration with elegance and finesse. The 170 acre Moppity Vineyard sits at the highest elevation in the Hilltops and the fully mature vines are among the oldest in the region. 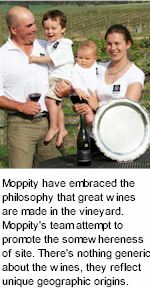 Moppity have embraced the philosophy that great wines are made in the vineyard. Moppity's team attempt to promote the somewhereness of site. There's nothing generic about the wines, they reflect unique geographic origins. Moppity wines are the ultimate expression of soil and micro-climate. They are different from the wines of other regions and different from the wines of other Hilltops producers. Every effort is made in the vineyard to promote fruit quality. 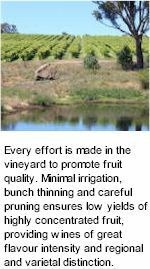 Minimal irrigation, bunch thinning and careful pruning ensures low yields of highly concentrated fruit, providing wines of great flavour intensity and regional and varietal distinction. The original plantings were established in the 1970s and are some of the oldest vines in southern New South Wales. Moppity's Reserve wines are typically sourced from the old, gnarly, low yielding vines. These old boys don't deliver much fruit but it's wonderfully concentrated. As they say, old vines make great wines! The vineyard is situated on dark red volcanic granitic clays, impregnated with basalt. Moppity have 170 acres under vine spread over 450 acres of undulating terrain. Plantings include shiraz, cabernet sauvignon, merlot, nebbiolo, chardonnay, riesling, semillon and viognier. There are multiple clones of each variety, five different shiraz clones as an example, each features distinct qualities. The result is a tremendous diversity in wine style depending on site, aspect, soil type and vine clone. The Hilltops climate is cool to moderate. Summer rainfall is low, so the growers can control vigor and optimise flavour development. The vines generally have the benefit of a long, even ripening period - this supports flavour and colour development and underpins the intensity of Moppity's wines. Although early spring frost is an issue in the district, the Moppity Vineyards are sited on undulating terrain, ensuring adequate frost drainage. Moppity's Reserve range is made in small quantities in only the very best years. The inaugural release in vintage 2006 was a Shiraz, which set the wine world alight winning top gold medal at the prestigious London International Wine Competition. The Estate range is sourced from the very finest fruit on the vineyard (unless a little makes the grade for the Reserve label). The focus is very much on quality and generally only around 5% of the crop will be allocated the the Estate range. No expense is spared in the winery and the wines have won numerous awards and critical acclaim. The Lock & Key range is named in reference to Jason Brown's 2nd fleet convict lineage and pays tribute to humble beginnings. They are single vineyard wines from mature, low yielding vines and represent remarkable value.